Want a simple way to increase engagement with your Facebook posts? Ask your followers a question at the end! 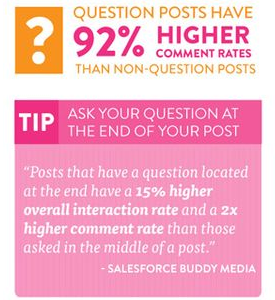 Studies show that posts with a question have a 92% higher comment rate than non-question posts. Make sure to ask your question at the end of the post though as that could lead to there being 2x the amount of comments than if you asked your question in the middle of your post!